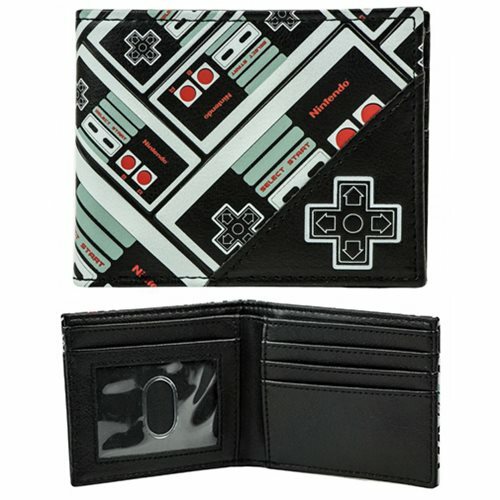 Go back to your roots with this Nintendo Controller All Over Print Bi-Fold Wallet. Relive those days of up up and down down with this awesome looking wallet featuring the NES controller. This throwback wallet is designed with a touch of synthetic leather and features 4 card slots, 1 slot with an ID window, 2 hidden slot, and 1 bill compartment. Show your love and carry your goods in style with this Nintendo Controller All Over Print Bi-Fold Wallet! Measures 4 1/2-inches long x 3 1/2-inches tall. Ages 14 and up.